September 2017 saw an investment of 20,000 service hours marking the third year of comparable investment as part of the current five year Route Structure and Service Design Review. The 2017 service changes went above the planned investment of 17,700 to compensate for under budget spending in 2016. Since the implementation of the 2017 Service Plan, performance standards and ridership have been monitored over a 12 month period in accordance with the Route Structure and Service Guidelines document. 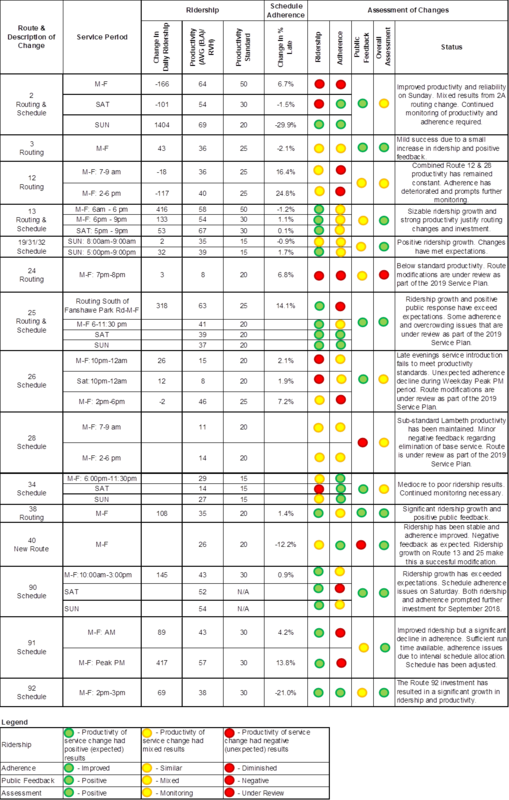 Table I, below, provides a summary of the 12 month assessment by route. Each of the service changes are discussed in more detail below including a high level assessment of the change compared to its intended impact. The following assessment of the changes is broken into two sections, routing modifications and frequency or span of service changes. Route 2A was re-routed to serve Argyle Mall and to serve Trafalgar Heights in the eastbound direction only. The modification was initiated by substantial negative public feedback due to changes from the 2016 Service Plan. Of concern, were the loss of connection to Argyle Mall and the decrease in service between downtown and Argyle Mall along Dundas. Overall, positive feedback has been received regarding the Route 2A modification. One recurring complaint is that reversion did not go far enough and Dundas St. between Hale St. and Clarke Rd. should revert to the level of service it had prior to September 2016. However, the current productivity in this section is below 50 and does not warrant further service. The level of ridership decline on Route 2 was unexpected but could be attributable to population decline in the Route’s service area east of Highbury Ave. N. Further monitoring of this area and its routing would be appropriate. As expected, the routing change had a negative effect on weekday service reliability due to its longer run-time. With 80% on-time performance, the 2019 Draft Service Plan proposes further investment in run-time to address this issue. Route 3A was extended to serve Argyle Mall weekdays between 6 am and 6 pm. The changes were intended to improve productivity by more effectively utilizing excessive Route 3 recovery time. The ability to travel directly to Argyle Mall from the Fairmont neighbourhood during all time periods has been well received and reliability on the route has improved. Route 38 was modified to operate along Thistlewood and Sunningdale to provide service to the YMCA and address a safety concern related to an un-signalized crossing of Adelaide at Blackwater. Positive feedback has been received from the public due to the YMCA service and from operators due to the elimination of the unsafe crossing of Adelaide St. N. at Blackwater. Ridership on the Route has grown substantially, but can only be partially attributed to the new routing. Most of the ridership is likely due to significant development in the area. Community Bus – Thursday service was modified to serve Sobeys at Wonderland and Oxford, Costco and Farm Boy. Service was removed from the Oakridge Superstore. Limited public feedback has been received. Route 13 was terminated at Masonville Place. The weekday and Saturday early evening (Weekday 6:00 pm- 9:00 pm & Saturday 5:00 pm – 9:00 pm) frequencies were increased from 30 minutes to 20 minutes. Route 40 was introduced to serve Northridge and Masonville. Route 13’s existing Northridge frequency was maintained during all time periods except for Saturday Early AM’s. Frequency during this time increased from 60 minutes to 30 minutes. The Route 13/25 changes have elicited a mixed reaction. Complaints have been received regarding the removal of a direct service from the Grenfell and Northridge neighbourhoods to Western University. However, the creation of a direct Masonville Place to Fanshawe College service has created an overwhelmingly positive response. The modified Route 25 has been a success beyond expectations. Ridership has nearly doubled and productivity has risen substantially. It is now one of the most productive routes in the system. The success has also created overcrowding issues at various periods. Further investment in Route 25 is planned in the 2019 Service Plan to alleviate overcrowding and stimulate further ridership growth. While the termination of Route 13 at Masonville Place has received criticism, the change has on balance been successful. Ridership and productivity had a sizable increase in the current and previous Route 13 service areas. Route 12 – The weekday peak period extension to Lambeth was eliminated. Route 28 – Service hours shifted to operate during weekday peak periods only (between 6:30 am and 10:30 am and 2:30 pm and 7:00 pm). Route modified to operate along Sunray Ave, removing service along Outer Drive. A few complaints were received regarding the loss of mid-day service to Lambeth. Total weekday peak service productivity for Route 12 and 28 has remained stable, indicating the service changes have had a limited effect. Route 2 – Sunday frequency increased from 30 minutes to 15 minutes between 11:00 am and 7:00 pm. The increased Sunday service has been well received, with a daily increase in ridership of 1404. Route 19/31/32 – Sunday service hours were extended earlier and later on the Route 32 portion of the route. Limited feedback has been received regarding this change. Productivity during the periods of service introduction have met expectations. Route 24 had one additional westbound trip added on weekday evenings. Limited feedback has been received regarding this change. An increase of 3 riders over an additional 30 minutes of service indicates limited success. Significant routing and service hour changes are proposed to Route 24 in 2019 which are projected to improve productivity. Route 26 Weekday and Saturday service was extended to midnight. Weekday PM peak (2:00 pm – 6:00 pm) frequency increased from 35 minutes to 30 to address schedule adherence issues. Ridership growth and productivity for the late evening service extensions has not met expectations. Limited public feedback has been received on the changes. The late evening service extension should be reassessed as other routes with overlapping service areas provide late evening service. The decrease in productivity during the weekday PM peak was expected as the intent of the change was to provide more recovery time and improve reliability. The decrease in reliability however, was not expected. The reliability issue is likely not attributable to a lack of run-time as our analysis indicates sufficient round trip time. Further monitoring is recommended. Route 34 – Service was introduced on Weekday evenings (6:30 pm – 11:30 pm), Saturdays (6:30 – 11:00 pm) and Sundays (9:00 am – 10:00 pm). During these time periods, the Route was interlined with Route 40. The productivity and ridership growth of the Route 34 service introductions has been slightly below expectations. While the weekday evening and Sunday services have been moderate, the Saturday service has seen limited uptake. The 2019 Service Plan proposes a number of changes for Route 34 which are anticipated to improve productivity and service coverage area. Route 90 had frequency improvements including during weekday base period (10:00 am and 3:00 pm) from 30 minutes to 20 minutes. Weekend service was introduced at 30 minute frequency (Saturdays 8:00 am – 6:00 pm, Sundays 10:00 am – 6:00pm). The introduction of weekend service on Route 90 has been among the most successful 2017 service changes. Substantial positive public feedback has been received regarding the change and ridership growth and productivity have exceeded expectations. Schedule adherence issues and insufficient run-time on Saturdays was a frequent concern amongst both riders and operators. Both ridership success and the schedule adherence issues led to further Route 90 weekend service investment in September 2018. This change will continue to be monitored as part of the 2018 Service Plan assessment process. Route 91 – Frequency increased during weekday peak periods (7:30 am – 11:00 am and 2:00 pm – 7:15 pm) from 20 minutes to 15 minutes. The Route 91 frequency increases have resulted in substantial ridership growth, and maintained high levels of productivity. Limited public feedback has been received regarding the change. The Route 92 investment has resulted in a significant growth in ridership and productivity. Limited public feedback has been received regarding the changes.